Used for temporary storage of baked goods and/or as can liners. High Density Polyethylene (HDPE) virgin resin material provides protection for short-term storage of baked goods. Food Contact: High Density Polyethylene 0.6 Mil is suitable for most applications involving direct Contact with foodstuffs. They are manufactured to meet current Food Contact regulations. FDA approved. 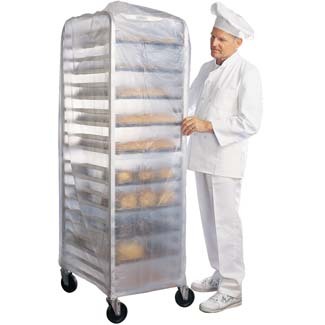 Bakery plastic bread and bun rack covers are designed to keep dough fresh and prevent free standing bakery, restaurant and cafeteria racks from airborne substances. Packaged in space-saving RhinoTuff® cases and wound in perforated rolls for easy one-at-a-time dispensing. These baking rack covers are made with a Star Seal Top and easily opens to pull down over any appropriately sized bread rack.